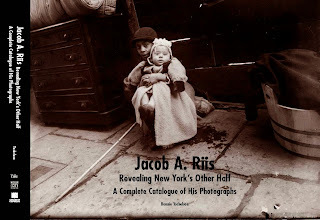 Jacob Riis: Revealing New York’s “Other Half”—a catalogue raisonné of photographs by Jacob A. Riis (1849-1914) accompanies a major exhibition at the Museum of the City of New York (mcny.org) open from October 2015 into March 2016. The show marks the centenary of the death of this great photographer and social reformer, who captured unique, and often shocking, images of New York’s immigrant poor at the turn of the twentieth century. The exhibition will be the first major retrospective of Riis’s photographic work in the U.S. since the Museum’s seminal 1947 exhibition The Battle with the Slum.The exhibition and accompanying catalogue are supported by a major gift from the Terra Foundation. The catalogue, edited by curator Bonnie Yochelson, is published by Yale University Press in conjunction with the Museum of the City of New York and the Library of Congress. The Museum of the City of New York owns the complete archive of photographs by Riis. The exhibition and catalogue are undertaken in a partnership with the Library of Congress, which holds the Jacob A Riis Papers. 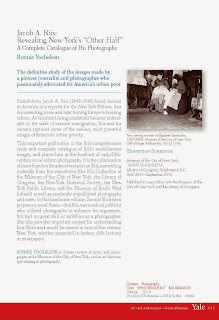 Dr. Yochelson is the author of highly praised books on Berenice Abbott, Alfred Stieglitz, Esther Bubley, and Karl Struss, among other important figures in the history of photography; and she is coauthor (with Daniel Czitrom) of Rediscovering Jacob Riis: Exposure Journalism and Photography in Turn-of-the-Century New York, first published in 2007 and reissued last year by the University of Chicago Press. Dr. Yochelson is on the faculty of the School of Visual Arts in New York. Jacob A. Riis: Revealing New York’s Other Half debuts at the Museum of the City of New York on October 7, 2015, and will travel in March 2016 to the Library of Congress, where it will remain on display in the Thomas Jefferson Building through mid-September 2016. In 2016-2017, the exhibition will travel to two venues in Denmark: the Kunstforeningen (GL Strand) in Copenhagen and the Kunstmuseum in Ribe, Riis’s native city. Danish-born Jacob A. Riis (1849–1914) found success in America as a reporter for the New York Tribune, first documenting crime and later turning his eye to housing reform. As tenement living conditions became unbearable in the wake of massive immigration, Riis and his camera captured some of the earliest, most powerful images of American urban poverty. This important publication is the first comprehensive study and complete catalogue of Riis’s world-famous images, and places him at the forefront of early-20th-century social reform photography. It is the culmination of more than two decades of research on Riis, assembling materials from five repositories (the Riis Collection at the Museum of the City of New York, the Library of Congress, the New-York Historical Society, the New York Public Library, and the Museum of South West Jutland) as well as previously unpublished photographs and notes. In this handsome volume, Bonnie Yochelson proposes a novel thesis—that Riis was a radical publicist who utilized photographs to enhance his arguments, but had no great skill or ambition as a photographer. She also provides important context for understanding how Riis’s work would be viewed in turn-of-the-century New York, whether presented in lantern slide lectures or newspapers. Museum of the City of New York, Gift of Roger William Riis, 90.13.1.148.